David Gressley (Director of Horticulture, Spring Grove Cemetery and Arboretum) sent me a video yesterday morning of a chorus line of Beech Blight Aphids (Grylloprociphilus imbricator) shaking their woolly derrieres in a synchronous samba. Frankly, I believe no other insect upstages this aphid in entertainment value. 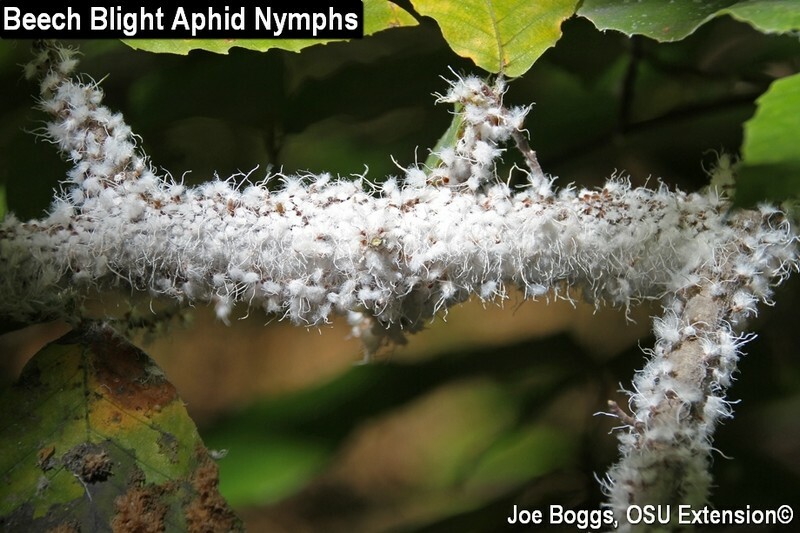 The aphid nymphs enshroud themselves in a profuse mass of white, wool-like filaments. Large numbers of these "woolly aphids" will gather together in prominent colonies and when disturbed, the aphids pulse their posterior ends in unison. This peculiar behavior has earned the aphid the alternate common name of the "boogie-woogie aphid." To see what I mean, just Google "boogie-woogie aphid" to watch several YouTube videos. It is speculated that this mass-wiggling distracts or dissuade predators and parasitoids from focusing on single individuals. However, research has shown that the nymphs are highly aggressive against predators. If the organized boogie-woogie doesn't work, the nymphs will mass-attack using their piercing-sucking mouthparts to inflict serious damage to no doubt perplexed predators. Perhaps the aphid's gyrations are actually a war dance! The aphids are only found on the twigs and branches of American beech (Fagus grandifolia). Despite their sinister sounding name and penchant for appearing in large white masses, the aphids cause little to no harm to the overall health of their beech host. However, they are prolific producers of honeydew. Even though aphid colonies are usually confined to just a few branches, it is common for sidewalks, parked cars, slow-moving gardeners, etc., beneath the colonies to become covered in sticky goo. Indeed, aphid colonies are sometimes discovered by observing circular or semi-circular spots of sticky honeydew on hard surfaces beneath infested trees. The sooty mold fungus, Scorias spongiosa (Ascomycete), has an obligate relationship with beech blight aphid honeydew; it does not make a living on anything else. In fact, the fungus is so specific to the aphid it is sometimes called "beech blight sooty mold." Fungal growth begins like most sooty mold fungi; it grows as a dense, black, "fuzzy" mat on top of the honeydew. However, over time, the mat thickens into a brownish, furry mass. Then the fungus progresses into a growth phase that is unlike most sooty molds; it produces a spongy, golden-yellow heap that may rise 1 - 2" or more above the leaf or twig surface. The odd looking fungal growths look like nothing else that would commonly be associated with aphids or honeydew. It may also attract yellowjackets and baldfaced hornets in search of a sugary meal. The fungus will grow anywhere that beech blight aphid honeydew is deposited which may present a diagnostic challenge. It is common for thick fungal accretions to appear on the leaves and stems of understory plants that are not hosts to the aphids. During the winter, the fungal accretions turn coal black and may remain evident through much of next season. The black masses are sometimes mistaken for more serious plant problems such as Black Knot fungal galls that occur on members of the Prunus genus.